Built to be easy for you and your company to use. Javelin is a user-friendly content management system that offers you a simple way to keep your site up to date by adding, deleting, or changing text and photos. 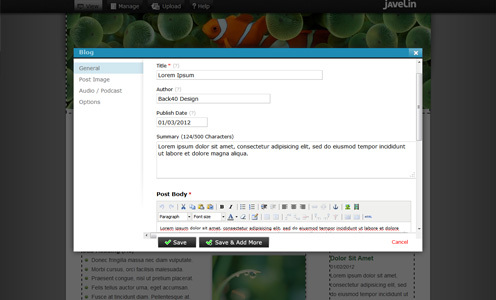 Javelin is an easy-to-learn content management system that uses a module and region based system of page organization. To get started, simply login, add the module of your choosing to the appropriate region and start adding content. Modules can easily be rearranged, edited, deleted, and restored. Pages can be added, moved, re-ordered, and deleted. Javelin offers a powerful way of keeping your website up to date by ensuring the updating process is easy to do.